James Smetham was a follower of Dante Gabriel Rossetti, and an English engraver and painter of the Pre-Raphaelite era. His career as a portrait painter had slow to take off due to photography developing at the time; something that had an impact on other artists during this period. This led to him being forced to take up a position as a teacher for a short while. He was also an essayist and an art critic as well as writing poetry, which was published in 1893 as The Literary Works of James Smetham, together with his essays. Born in Yorkshire, in Pateley Bridge, on 9th September 1821, Smetham went to school in Leeds. He was an apprentice in architecture; however, he decided that he wanted to pursue a career in art. In 1843. he began his studies at the Royal Academy. When his portrait painting was slow to take off he turned to teaching and in 1851 took a position at Westminster’s Wesleyan Normal College, it is here that he met Sarah Goble, who he married in 1854. Together they had six children. Working in a variety of genres, such as those with a religious or literary theme, Smetham began his painting career in portraiture but is probably best known for his landscapes, which are likened to the works of Samuel Palmer, William Blake, and John Linnell. In total, he produced around 430 paintings as well as 50 etchings, book illustrations, and woodcuts. The Dream, his painting from 1856 is probably his best-known work but he is also very well known for The Hymn of the Last Supper, an incredibly ambitious subject matter choice that he undertook. Known for his often-bizarre choice of subject matter The Death of Earl Siward, a painting which depicts a dying earl standing up in full armour and supported by servants as “he did not wish to die lying down like a cow” is amongst his best paintings. After having a mental breakdown in 1857, Smetham became a devout Methodist. His life took on an increasing religious aspect, which eventually led his to insanity. During this time, he tried to illustrate all the verses of the bible. Using a process, he referred to as squaring he made small, postage stamp sized pen and ink drawings; he produced thousands of these during his lifetime. In 1877, he experienced a final breakdown and lived in seclusion until he passed away on 5th February 1889. During his lifetime Smetham wrote a number of articles and reviews including The Life and Times of Sir Joshua Reynolds and Alexander Smith, as well as some poetry. 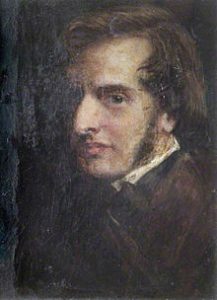 On his death, his letters were published posthumously by his widow; these letters throw light upon many his contemporaries including Rossetti and John Rushkin. These works have been praised for both their literary and spiritual qualities they portray. They also delineate clearly the depression that had clouded Smetham’s outlook during his later years.